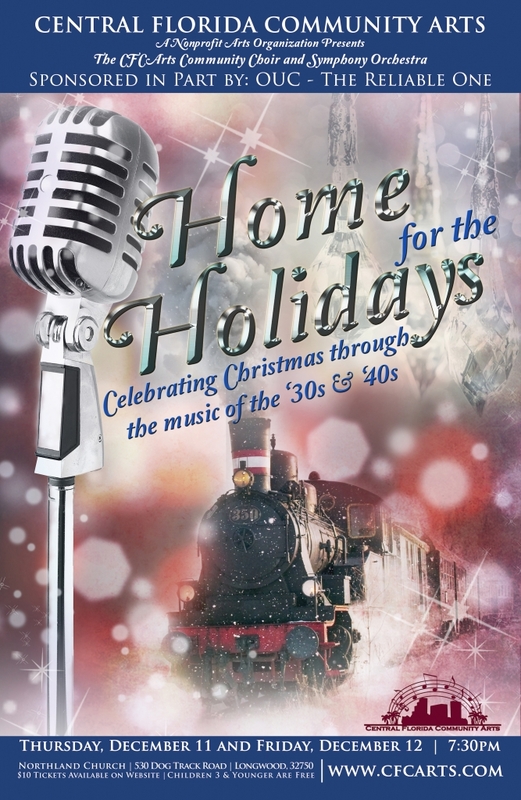 Join us for this holiday tradition as we proudly present Home for the Holidays, a production performed by members of our CFCArts Community Choir and Symphony Orchestra. Transport back in time to the 1930s and 1940s, where the music of Christmas found its sound and big band and swing entered the scene. Follow the hero and his family as he makes his way home for the holidays and the music that brought them together! Featuring our 300 voice choir and 100 member orchestra, Home for the Holidays will be a Christmas spectacular that the whole family will be sure to enjoy! Home for the Holidays will be held at 7:30pm on Thursday, December 11 and Friday, December 12 at at Northland, a beautiful, 3,100-seat state-of-the-art venue located at 530 Dog Track Road, in Longwood. General admission tickets are $10 each. A limited number of priority seating tickets are available for $50 – these tickets also include a professionally recorded CD of the CFCArts Community Choir’s brand new 2014 Christmas CD! Children age 3 and under will be admitted for free.